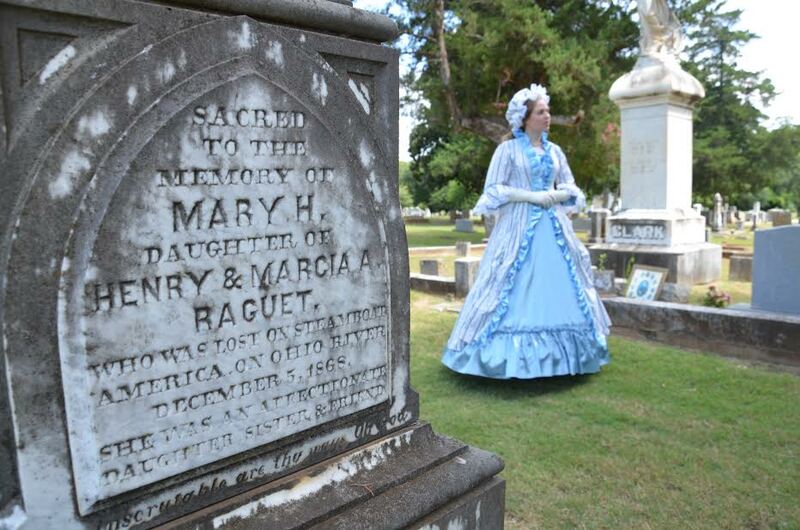 Nacogdoches, Texas- On Saturday, March 28, 2015, the Friends of Historic Nacogdoches, Inc. and the City of Nacogdoches Historic Sites Department will host the 3rd annual Living History of Oak Grove Cemetery Tour. Oak Grove Cemetery was first established circa 1837, and it was later designated as a Historic Texas Cemetery by the Texas Historical Commission. Among those buried there are soldiers, four signers of the Texas Declaration of Independence and a number of local citizens, all of whom helped shape East Texas. This event will highlight seven prominent families and individuals who lived in Nacogdoches and helped establish the City we know today. Costumed interpreters will portray the lives of Charles S. Taylor, Mary Schindler, and Bennett Spradley, to name a few, and talk about “their” lives. In addition to learning about the lives of these people, tour guides will talk about significant marker shapes, motifs and symbols representing fraternal organizations, religious iconography and personal interests on the headstones. All funds raised by this event will be used to build and preserve the “bricks and mortar” portions of Nacogdoches history. For instance, the Friends of Historic Nacogdoches will use the funds to help with projects, such as the creation of the statues around town, the annual Christmas Tour of Homes and any other events that come their way. March 10, 2013, most of the clocks in the U.S. will spring forward an hour. While some folks depend on the groundhog to tell them if winter is over, others no for certain the end is in sight when it is time to spring forward. Day Light Savings Time (DST) begins at 2 a.m. on March 10, so put a spring in your step and don’t forget to set your clocks an hour forward this weekend!